The value or price of something is always determined by the supply vs. demand. In an economic collapse, the supply of many items will be greatly reduced which in turn will increase the price. 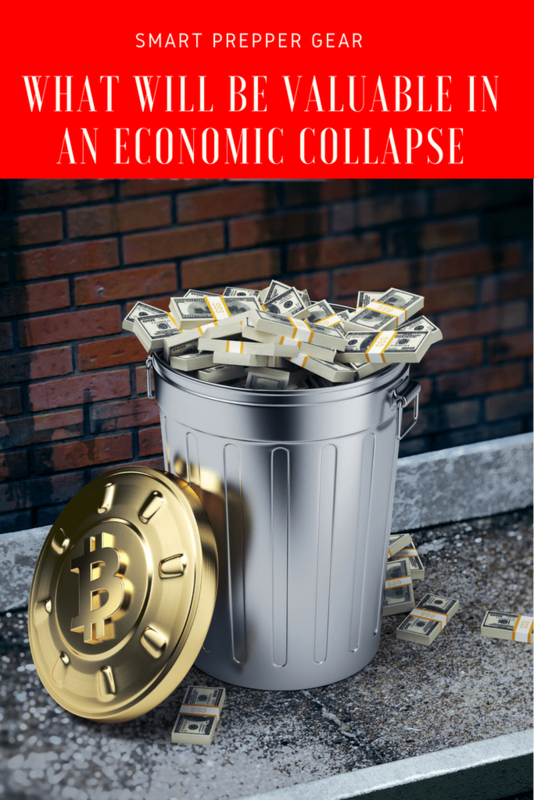 So in this post, we are going to discuss what will be valuable in an economic collapse. An economic collapse will slow down the flow of commerce and trade. We will see importing and exporting from and to countries will drop rapidly. The busy highways of semi-trucks hauling goods will come to a screeching halt. So the demand for those items will increase as they become harder to get during a collapse. Along with that, the demand for other goods which was relatively low before the collapse will then skyrocket. For an example, gardening tools will be highly demanded in an economic collapse because many will turn to growing their own food during this time.As a prepper, we not only want to survive during an economic collapse but more importantly thrive. To thrive means to flourish or prosper. I don’t know about you but I don’t want to be barely getting by day to day after an economic collapse. This is will already be a stressful situation. In order to prevent that then we need to start preparing now. This is why it is important to get an understanding of what will be valuable in an economic collapse. 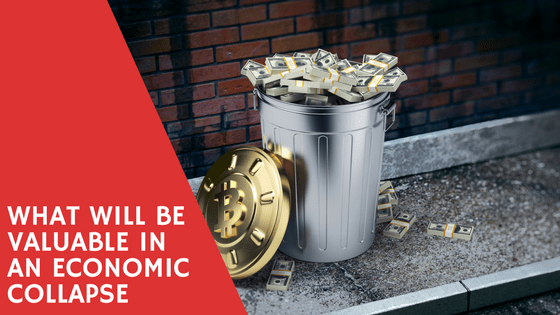 What will be valuable in an economic collapse? Oil will no longer be the liquid gold during an economic collapse. Instead, the demand for oil will probably decrease as many are laid off or lose jobs. People will stop traveling for leisure or business. Instead, water, especially drinking water, will be highly sought after. Many grocery and convenience stores will go out of business during an economic collapse. The stores that remain open will become bare of goods. American’s specifically, have become mostly urbanized in the last hundred years. We are no longer taught to be self-sufficient with our own sources of water. Instead, we mostly rely on city water. This isn’t always safe to drink and tastes horrible. In a collapse, I believe that many water systems across the country will shut down. As a result, many city slickers will be searching and scavenging looking for water. Along with that, the need for purification systems will increase. Collecting city water has a lot of health risks with it. This risk is much higher than rural water collection. Therefore, many will be turning to natural sources of water and seeking to become self-sufficient. As a prepper, it is important to have our own sources of water in order to multiply our survivability. As I mention in the book, if you don’t currently have your own source of water then there needs to be a strategic plan to one day attain it. In meantime, if you are in a collapse without your own source of water then you will be forced to collect from other sources. So having a collapsible water bag can be super helpful. It is lightweight and easy to carry. You will also need ways to purify your water with water filters and purification tablets. At the time of this writing, you find some for a reasonable price. After a collapse, the price will skyrocket. I would recommend purchasing some of these items to barter or sell during the collapse. You can make a decent profit and thrive during such an event. Food is another important item of survival. You can only survive 3 weeks without food. However, during a collapse, I wouldn’t recommend bartering or selling your emergency food storage. Our society is so used to having food quickly. There are fast food restaurants on almost every corner. Then we have microwaves to provide us with a dinner in only a few minutes. During a collapse, this convenience will hardly exist. This is along with many grocery and convenience stores shutting down. Food will become scarce. Since you are not able to plant and reap a garden overnight there will be a lot of looting for survival items such as food. So you will need to have your emergency food stored securely. In order to really thrive, I recommend growing and raising your own food now. Now, this can be used to barter or sell during a collapse. Not only that but it will increase your survivability by becoming more self-sufficient. Piggybacking off of the previous point is that you will need land in order to grow a garden. Trying to find private land for a reasonable price during an economic collapse will be challenging. This is especially true if you are jobless and can’t afford it. This is why it is important to find private land now. It is easier said than done, I know. Most preppers are on a very low budget. However, it’s not impossible. There are many websites like Landwatch where you can find owner financed land. So if you can’t afford to get a loan through a bank then this can be a reasonable option for you. Having a fortified shelter on the land that you own will increase your survivability a ton. Having a shelter helps you to survive rough weather conditions. It also protects you from other outside threats like looters. If you don’t own a home during an economic collapse then there is a high chance that you can be forced out. Many property owners will fall behind on mortgage payments. This could force them to sell the property to pay off the loan. The other option is that they can jack your rent sky high forcing you to become homeless. This is why it is important for preppers to get out of debt and purchase their own land and property. In order to do so, we must prepare on a strict budget. We must also put together a strategic plan now so that you are not forced to bug out. Again, I talk about how to put together a bugout proof plan on a budget in The Strategic Prepper eBook. Another option to have are tents or shelter systems. A low-cost way of having a shelter is to learn how to bushcraft a shelter. Such survival skills are one of the many prepper skills that will be imperative to have during a collapse. Not only are they important for you to have but they will be valuable bartering items during a collapse. So you could stock up on shelters or you could produce your own to barter. You can typically find tarps for about $10 that can be used for shelter. Yes, a shelter does provide protection from weather elements. However, you can’t be cooped up in your shelter all the time. You will need to go out to gather, hunt or work your garden. So if you live up north then you will be facing extreme weather conditions. Therefore you will need to have 3 specific layers to stay warm. Those three layers include the base layer, insulation layer, and shell layer. The base layer is designed to wick moisture from your sweating body to prevent hypothermia. The insulation layer is designed to trap your body heat to keep you warm. The shell layer is designed to block the outside cold from penetrating your body. Hand tools at this moment are already a wise investment to have. So in an economic collapse, they will be so much more valuable. This is because you most likely won’t be able to call on maintenance to come fix things at your location. Instead, you will be forced to become self-sufficient and fix items yourself. In order to keep your shelter fortified you will need some security systems in place. One of the few security layers that you should have include ammunition and firearms. This will be more important than ever to have since violent crime will skyrocket. People will be willing to kill others just for some canned food. On top of that, there will probably be government takeovers or foreign invasions. Either way, they could do some serious harm with the amount of firepower that they have. Now, I’m not saying that you should stock up on AR 15s to fight off the government. Because they have tanks and drones that can demolish you. You don’t stand a chance. So you will need to choose your battles wisely. With that being said, many other people will be looking to defend themselves during this time. People will be willing to pay high prices in order to protect themselves. The price for ammunition will at least quadruple during a collapse. With so much violence going on during an economic collapse it will be important to have emergency items like first aid kits. Along with that antibiotics will be in high demand to fight off infections. Most likely hospitals will run through or be taken over. Therefore it is important to have your own medical emergency supply. You could also stock up on these items to barter or sell. In an economic collapse, it will be a hard struggle for those that are addicted to things like alcohol, caffeine, and tobacco. It will be especially hard for those that are addicted to illegal drugs. Many will go to great lengths and pay higher prices to attain those items. I don’t know about you but I need my coffee. Without my morning coffee, you wouldn’t want to speak with me. During a collapse, I know that it is going to be especially challenging. There are many people just like me that will need or want their caffeine fix. Now I’m not saying that you should stockpile on illegal items. Instead, focus on those that won’t land you behind bars. You can find cheap alcohol, coffee, and cigarettes. These will be highly valued during a collapse. During past economic collapses and financial crisis, we have seen inflation skyrocket. This means the value of the paper dollar will become worthless. Stores and other traders will begin rejecting the dollar. Coincidentally the value of precious metals stays consistent with the rise of inflation. Precious metals hold tangible value compared to the fiat currency. There are many uses of silver that keeps the demand for silver so high. This is one of the many reasons preppers should have silver. On top of that, silver has always been recognized as a symbol of currency across thousands of years. When the dollar collapses then many will return to using silver as currency. Now those that are struggling for survival during a collapse would probably care less about purchasing precious metals. They will be focused mainly on survival items such as food and water. However, in order to purchase those items at the store, you will need to provide something of value. Junk silver will most likely be the most recognized form of currency during a collapse. Most stores and those that deal with money on a daily basis understand the real value of junk coins. These coins contain 90% silver. Therefore it represents value. There are a few ways to collect junk silver. First, you should look through your change drawer to find quarters and dimes that were produced before 1965. You could also exchange dollars at a local change machine to see if you can find some. If those options don’t work then I would recommend checking out SD Bullion where I get most of my silver. The great thing about SD Bullion is that they don’t require a $100 minimum order. Most bullion companies require a $100 minimum order. Instead, I take about $20 to $30 of each paycheck to buy silver bullion. You don’t have to go broke trying to prepare for such a situation. Altogether these would be my suggestions on what will be valuable in an economic collapse. If you have suggestions or feedback then please leave it in the comment section below. Your feedback helps the community prepare the smart way now so that we can thrive later.